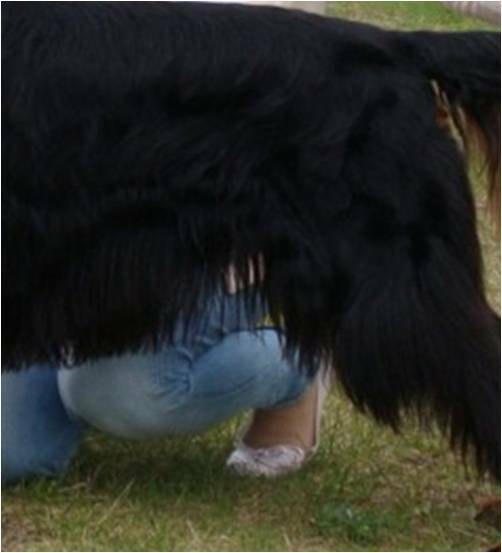 Loin coat that’s become a bit thin…could be the dreaded “pee feather” syndrome. We’re talking today about all the beautiful coat that looks so great when it’s growing evenly down from the loin area. But as we’ve all seen or perhaps experienced, if you don’t stay on top of grooming it, that coat becomes dirty, matted and brittle in a minute. Then, before you know what happened you’re missing chunks of coat or the coat looks all thin and straggly, and unless you even the ends out with scissors it looks ragged compared to the rest of the dog’s coat. Maybe not the picture you intended to present in the ring and especially if you’re headed for BOB or Group judging. To be competitive you do want to stay on top of little things. So, proper grooming of the male does have it’s own particular quirks and there are many of you out there who may be wondering what the secret is and others who could share your tried and true solutions with them for maintaining coat. Jodi Hurd-Cavanagh had offered her suggestions in a comment on a previous article (Thank you Jodi!) and we are publishing that again here to start the discussion…what do you do to maintain pee feathers? Type away folks, use the comment section to share your solutions or to ask more questions. I use a mixture of 1/2 Listerine (the original kind) & 1/2 water. Keep it in a spray bottle. Spray the entire pee feather area-including the feathering on the back legs then rinse it out with warm water. If I let the coat go more that a couple days I can see the urine come out of the coat. A very easy & inexpensive way to keep pee feathers clean taught to me by an Irish Setter friend. Jodi, do you give a FULL bath every other day, or do you just wash the long hair? We always rinse boys’ pee feathers with water before coming back in the house (so, a few times a day) but it sounds like that may not be good enough to prevent breakage? I’m not sure how Jodi will respond, but my method is to only wash the pee out of the pee feathers, being sure to get all the sticky, smelly area good and clean. Full bath every other day, the big key is getting all the soap and conditioner residue out with rinsing. this is the protocol I used to maintain Regis’ very full coat when I was showing him. 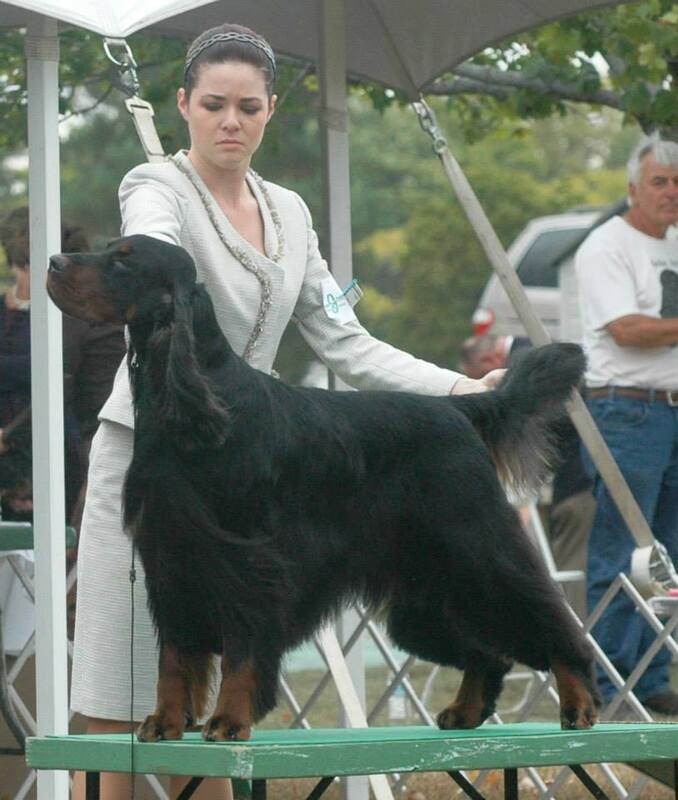 Too bad he doesn’t like being a show dog as he certainly grows the coat for it. LOL Dirt will cause hair breakage, and anything sticky on the coat will attract the dirt. Don’t laugh, but tube tops from the girl’s dept at Walmart are great belly-bands to help male Gordons stay clean. Of course, you don’t use it exactly like a belly-band on a puppy, but allow the dog to relieve himself while keeping his feathers cleaner. It’s not a substitute for daily coat care, but it helps. I always tried to buy black tube tops because they blended in with the dog’s coat. I agree Laurie. I find the self rinse to be very drying and have stopped using it all together. There seems to be no replacement for a good old fashioned shampoo and conditioner!